THE DEATH OF Seamus Heaney was a hard blow for his loved ones, and the nation as a whole, earlier this month. Tributes flowed to the Nobel laureate poet from far beyond Irish shores, not least a front-page dedication from the New York Times. Today, further tributes were paid to Heaney in the course of Oireachtas business, with one of the most striking coming – surprisingly or not – from the Taoiseach. He – or his speechwriter – took the time to mould it in a verse-like form with some phrases, especially the opening, calling to mind Heaney’s much loved Mid-Term Break. As Friday mornings go, it was busy. Those with young families out early buying the last of the books, lurid lunchboxes. Everybody here making calls, lists, readying offices for the start of the new term. All of us noticing the change in the light. All day, word of his death broke radio schedules, consciousness, the heart of a nation. There would be no-one now to keep the gap from Joyce’s salt strand to Molly Bloom’s rhododendrons and roses or the Fianna’s Binn Eadair. From that day there would be no man marooned in his own loft, a birch planted 20 years ago,between him and the Irish Sea. Searching, as he put it ‘for that one piece of language that fits exactly’. And as he sought, he found. It’s almost two years now since Seamus, Marie, Michael, Christopher and Catherine Ann gifted us those finds in the Heaney archive. Again, the light was changing. It was Advent, the winter solstice in fact. On that day, we were given a gift, beyond precious metal, incense or ointment or all they signify. A gift from one who could disarm kings, inspire presidents, heal hurts, break hearts, make cures at Troy and burials at Thebes and miracles out of all of us. Or as a new family of Europeans, united through the unstrange word at the Fionn Uisce the Beacons at Bealtaine. For him, it was only all and ever about memory and ‘the state of us’. So much has been written and said about Seamus Heaney in the last 26 days. In the media there was the particular eloquence of Theo Dorgan, Fintan O’Toole, Andrew O’Hagan. In the church at his requiem mass, we held our breath. The building itself seeming to catch itself and listen as Paul Muldoon shared his impeccable and devastating observations. On heartbreak, general and particular. On the matter of Seamus Heaney’s beauty. On the matter of his being kind and decent. And the greater business of his being the first and eternal champion of his daughter, Catherine Ann. In that moment Paul Muldoon made them Everyfather, Everydaughter. Because every father and daughter present or watching recognised in the story and its telling the power of something that was not just a life gift but a birth right. 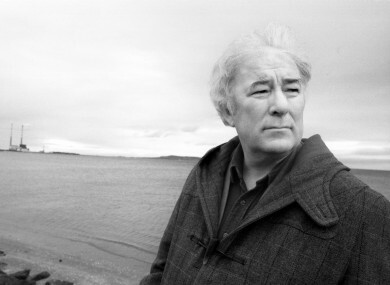 Inevitably the politics of birthright was the backdrop to so much of Heaney’s work. In the days since his death the lines about ‘hope and history’ have rhymed across the world as private and public figures reacted to the news. But for me, it is what Seamus Heaney says about his translation of Dante’s Divine Comedy, that best sums up his very particular and considered view of the poetic and the political. Across the world Seamus Heaney was and is seen not alone as Ireland’s better self but I believe its best-self possible. A self alive to and with what he called “the potency of myth” . In June he spoke to the Paris Revue de Belle-Lettres about “journeys to the underworld” not alone in Dante, but Virgil and Homer. Today. I am certain he has met them. Those links in the human chain. Today, we miss and mourn and celebrate the incomparable Seamus Heaney. We give thanks joyously, graciously, humbly for the gift of him in our national life. He who was our voice, our hearth, our ‘home’. Email “Enda Kenny's poetic tribute to Seamus Heaney is quite moving”. Feedback on “Enda Kenny's poetic tribute to Seamus Heaney is quite moving”.